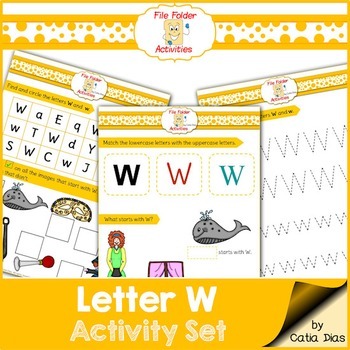 File folder activity sets are the perfect type of resource for centers and independent learning. 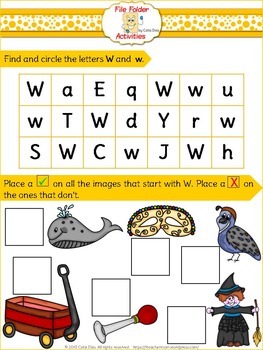 They are ideal for use as an extra activity for those students that always finish early, to take home as a sort of fun homework, or to do individualized one-on-one work with a specific child. You can have a whole activity in one folder, neatly presented and organized. 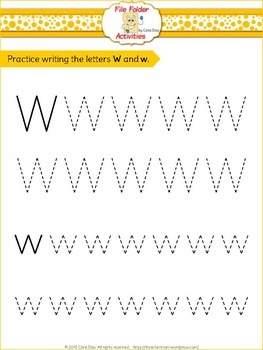 This activity set has several activities for the letter W.
In one page, your students can practice tracing both the uppercase and the lowercase letters. 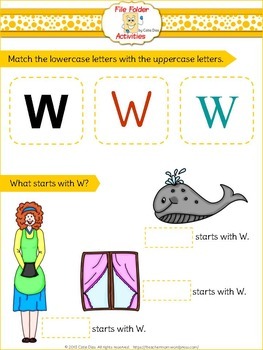 There are also activities to help them associate the letter to things that begin with that letter. This resource includes assembly instructions but you can also visit my blog at www.always-teacher-forever-mom.com for a step-by-step photo tutorial. ☞ ☞ Click on the green star under my store name to follow me and receive updates on new products. ☞ ☞ Don't forget to look at the PREVIEW to get an idea of the contents of this resource!! ☞ ☞ REMEMBER to leave feedback! TpT will reward each feedback with credit points that can be used for purchase of any other TpT products! Click here to learn more about TpT credits.